The rumors about the new "plastic" iPhone (may be called the iPhone 5C, according to a recent leak) have been ramping up over the past couple of days, and now an enterprising case manufacturer has released a set of "iPhone 5C" cases on Amazon.com (via Nowhereelse.fr). The three cases, which are available in black, navy, and white, appear to be in line with low-cost iPhone dimensions that were leaked by another case maker in June. The low-cost iPhone is expected to be similar in size to the current iPhone 5, though with a rounded polycarbonate shell that comes in an array of colors. MacRumors commissioned renderings in July showing what the phone could potentially look like based on current schematics. It is not unusual for case manufacturers to use rumored case specs ahead of product releases to get a jump on manufacturing. 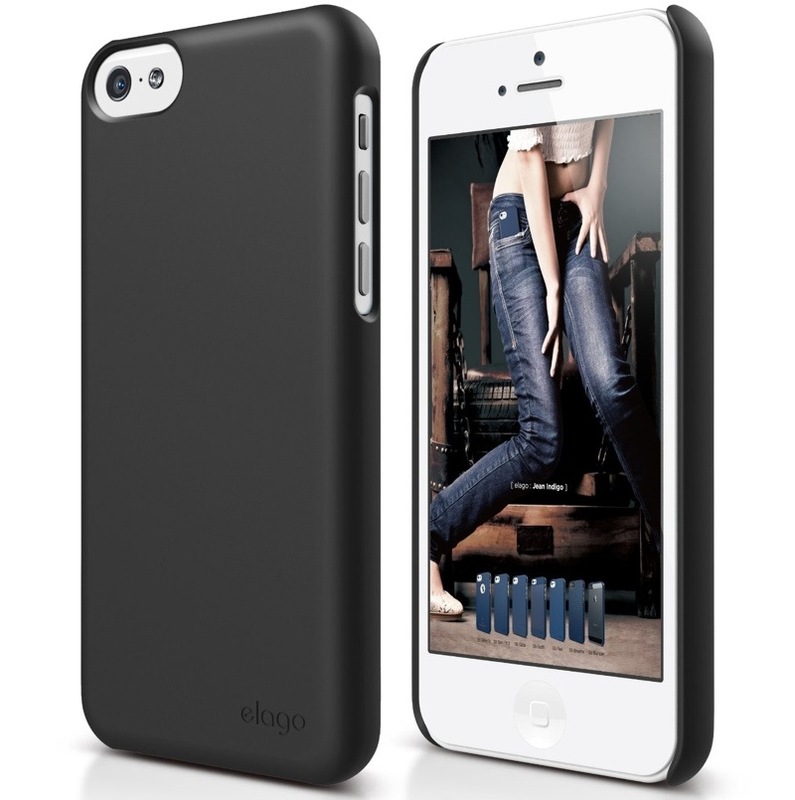 Creating a case based on unconfirmed measurements is always a gamble, however, and there is no guarantee that elago's "5C" case will fit the finalized product that Apple produces. Today’s work is to paste protective film on the iPhone's plastic back cover to prevent it from being scratched on assembly lines. This iPhone model with a plastic cover will soon be released on the market by Apple. The task is pretty easy, and I was able to work independently after a five-minute instruction from a veteran employee. It took around a minute to paste protective film on one rear cover. The new cell phone has not yet been put into mass production, so quantity is not as important. This makes our job more slow paced than in departments that have begun mass production schedules. According to recent reports, Apple's low-cost plastic iPhone is expected to be launched sometime in the fall, potentially as early as September. A plastic case for a plastic case. Be a critic all you want. Those first out of the gate for 5C cases are going to make a killing. When you buy a cheaper phone, you have more cash for accessories. Also, lower end electronic consumers are notorious for accessorizing. Think of it as a cheap Honda or Toyota all blitzed out. You don't see higher end cars with as many accessories. Yo dawg, we heard you like plastic cases, so we put a plastic case on your plastic case so you can-- Oh I can't even be bothered. I agree, as Art it was quite clean & attractive. As a phone mine was crap. Sitting on the desk unused, was its finest hour. Thanks to Google & Samsung I had an excellent Android phone to enjoy and rely on. guess you werent around for the 3G and 3GS -- both record sellers and both had plenty of aftermarket cases. For a phone that was around for quite awhile, there is a starling amount of amnesia when it comes to the 3GS. I think if these things have a retina screen, its quite possible they will canibalise 5S sales - I mean beyond us 'fans' on here (or maybe I'm speaking for myself! ), I bet a lot of people will not be over concerned about the plastic. The 3G/3GS back was great for the most part, a lot people REALLY liked it even. Same software, same screen, same screen size, and I'm really not sure people will choose to pay significantly more for the 'premium' that is the 5S i.e. a bit faster, a bit better camera and a finger print sensor (so we think anyway)..
Why is that girl in the ad peeing her pants?